Teach me To Play - an easy to use programme for parents and professionals, of games and activities and specifically how to play them to teach children at the early stage of social development the earliest building blocks of play: eye contact, anticipation, sharing agenda, beginning to take turns and first steps towards small group activities. Teach Me Five Steps for Speech And Language - a work-through book with simple assessment tools, linked to strategies, ideas and activities to develop children's vocabulary, oral motor skills, listening and sound discrimination skills and more. Intended for children at the pre verbal, single word and short phrase stage of language. First Aid for Supporting Behaviour - a practical tool kit with photocopiable masters, games, strategies and activities. 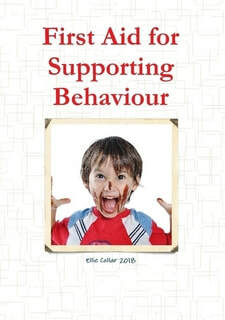 Follow the flow chart guide and use the tools in the book to analyse and assess behaviours, select the games and activities your child needs to develop turn taking, waiting, coping with big feelings and other skills from the suggested lists, and write them a behaviour plan that really works. For Early Years Keyworkers, Childminders and SENDco, parents and teachers. This book is designed primarily for 0-5 but may also be useful for older children with additional needs.